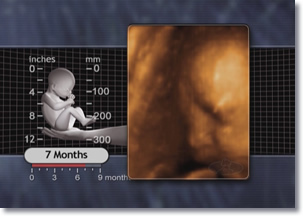 Sleep patterns follow circadian rhythms starting in the 28 week fetus. As this boy reaches his 8th birthday, his lungs will finally have their complete number of alveoli – those important microscopic structures that help our body exchange oxygen and carbon dioxide. 1 Mesiano and Jaffe, 1997. 62-63. 2 Connors et al., 1989. 932; de Vries et al., 1985. 117; Patrick et al., 1980. 26, 28; Visser et al., 1992. 178. 3 Lauria et al., 1995. 467.